Rajesh Exports Limited (REL) headquartered in Bangalore, India manufactures gold & diamond jewellery. REL exports its products world wide and distributes them within India to the wholesale jewellery market. REL also retails its products through its own network of retail jewellery showrooms Shubh Jewellers and Laabh Jewellers spread across India. White labels: expanding its market by supplying white labels to retail chain stores across the world. Let's have a look at the financial numbers of Rajesh Exports. As per March 2009 results declared, 12,076 Crores with reported net profit of 87.38 Crores. So if you look at the net profit margin, it comes at lesser than 1%, to be precise, at 0.75%. 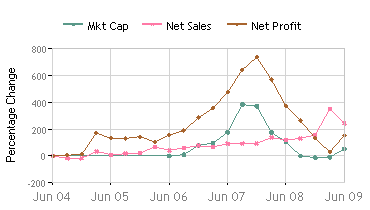 In March 2007, net profit margin was more than 2.7%, so company has been growing in terms of sales turnover may be on account of rising gold prices, since they have high volume of Gold traded, higher are the numbers but 0.75% net profit margin looks pretty bad. EPS was at Rs. 3.4 compared to 8.24 in Mar08, 27.42 in Mar07 and 18.01 in Mar06. Let's have a look at recent quarterly numbers. For Jun09 quarter, 3672 Crores was the turnover with net profit of 18.45 Cr. This stands at 0.50% Net profit margin. Rs. 0.72 was the EPS for quarter. The only positive factor is, they have 5573 Crores of cash reserves. It had shown tremendous growth in period of year 2005 to 2008. Recession and economic downturn has clearly shown it's effect on company's profitability. Have a look at this Graph. Looking at the depleting net profit margin and decreasing profit numbers in past 1 - 2 years time, I do not think company can do wonders soon in next few quarters. From short term persepctives, I would not advice to buy stocks in this counter. Stock traders are trading on account of speculation. If you can catch these volatile movements you can make money. From long term perspectives, I find the valuations at higher side and so would advice to not to buy stocks at this moment. P/E ratio of above 30 at CMP is uncomfortable for investment. Wait for correction. It can be good investment around 50 - 60 levels for long term, provided Rajesh Exports management turns the numbers towards north.